The Upper Nisqually River in the rainy season. 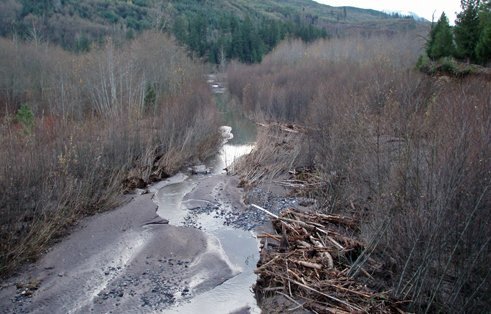 Storms in 2006 severely battered the region and multiple areas along the Nisqually River. A post-storm view of the Upper Nisqually channel. The Sunshine Point campground was once located in the foreground. 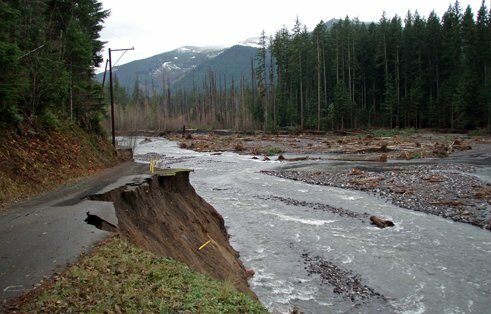 GeoEngineers responded quickly to deliver accurate flood-damage data. 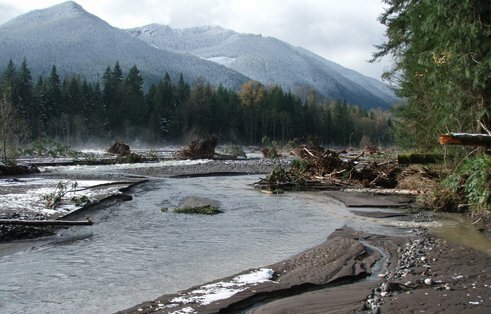 In November 2006, GeoEngineers was midway through a channel migration zone (CMZ) study for Pierce County on the Upper Nisqually River when heavy storms battered the region. The storm damaged a number of bridges and caused extensive changes to the river channel. With a State deadline quickly approaching, the County had to quickly revise the CMZ study to reflect the storm damage. To create a visual baseline for the study, GeoEngineers loaded pre-flood aerial photos into a handheld GPS unit and referenced them to GPS coordinates. GeoEngineers’ channel migration specialists then flew the river by helicopter, reviewing actual conditions on the river with the pre-flood photos. The team was able to immediately provide exact GPS coordinates where large channel changes had occurred and relay this information to County planners, who used the information to plan and prioritize their efforts. GeoEngineers provided the County with detailed information regarding the type and magnitude of channel changes within three days, allowing the client to meet the State reporting deadline, despite the dramatic channel changes. By using infrared instead of standard photos, GeoEngineers was able to distinguish the difference between damaged vegetation, woody debris and the active channel to indicate flood damage accurately. Through a creative arrangement with a subconsultant, GeoEngineers was able to reduce the client’s orthophotography costs by two-thirds. "From start to finish, it was clear that GeoEngineers was the right firm to hire in order to develop and complete the project."